So, you’ll have to wait just a bit longer for Dr. Robert F. Thomas Foundation’s next Evening of Elegance. Mark your calendars for March 2, 2019! Many thanks to our guests and sponsors who made the 2017 event a success! For more information call Amy Woods at the Dr. Robert F. Thomas Foundation at 865.446.9628. Visit and like our Facebook page for updates! 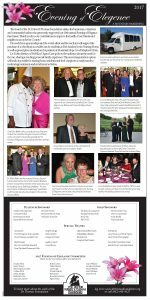 Check out this wrap up of our 2017 Evening of Elegance. You might see your smiling face!